1603. Queen Elizabeth is dead, and James I is in power. Sir Walter Raleigh is imprisoned in the Tower for conspiring against the new king. 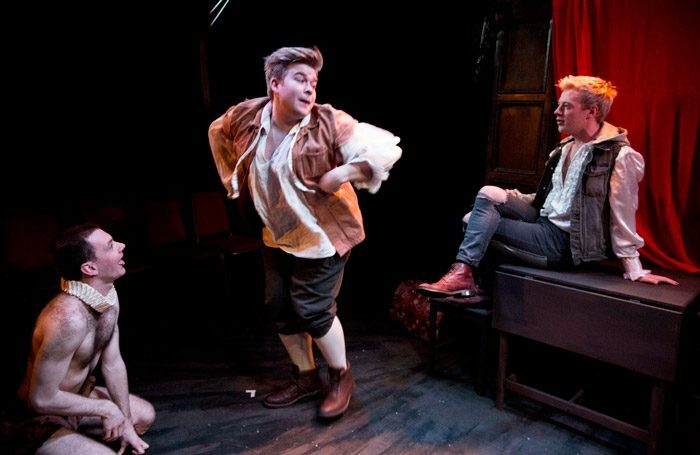 His lover Mary pines for him in her stately home in Wiltshire, so she and her handmaid plot to secure the king’s favour by putting on a new play just for him, by Shakespeare’s company of players. The backstage comedy begins with this simple premise, but incorporates entirely too many underdeveloped subplots that overcomplicate and dilute the primary storyline. There’s love, revenge, jealousy, misplaced affection, refugees and a talking dog – amongst others. Though there’s scope to explore creative control, the influence of money and power over art, and homosexuality in a world where it’s illegal, these are barely touched on, if at all. The attempt to create a silly story is a missed opportunity with a lack of dramaturgical focus. There are some lovely performances in the cast – James King as Raleigh’s dog Chop is an exemplar of animal work and physical performance. Olivia Onyehara is a spunky and spirited maid Peg. It’s only a shame she isn’t given the depth or time to explore the character’s emotional landscape. Ian Hallard cuts a serious, authoritative Shakespeare, bedecked in a shirt and earring inspired by the Chandos Portrait. Director Matthew Parker keeps the short scenes moving at a good pace and makes the transitions visually dynamic. The aesthetic he’s chosen – a mashup of Shakespeare and the 1987 film ‘The Lost Boys’ – suits the players’ rollercoaster friendships. But it doesn’t bear any particular relevance to the story, and otherwise feels superficial. Parker’s a director with clear vision and a unifying approach to directing, but in this instance the script doesn’t serve his talent. The narrative arc is woolly and lacks clear authorial intent, making for a frustrating experience of unfulfilled potential. Foul Pages runs through 17 March.